For many of us the worldwide recession and the stock market crash of 2008 / 2009 is still fresh in our minds and the effects have been very painful. Many good books have been written on the recession and many with in depth analysis and interviews of major key players during this period. I will not duplicate what they have said but will look at it from a financial systems point of view - the main causes of a severe recession. Do you remember the movie ‘Wall Street: Money Never Sleeps’? In that movie the wheeling dealing financier, Gordon Gekko acted by Michael Douglas, shows us a chart of the price of tulips in 1637. You will observe that the price of tulips sky rocketed to the point a tulip flower was worth more than a house. It’s amazing that a lump of ‘decay-able’ vegetable matter could be priced more than a house but people are crazy that way when they catch ‘Gold Fever’. Actually what the chart was showing us was that the price of tulips had begun to oscillate and there was a real economic crisis due to the tulip mania and most probably a severe economic recession. 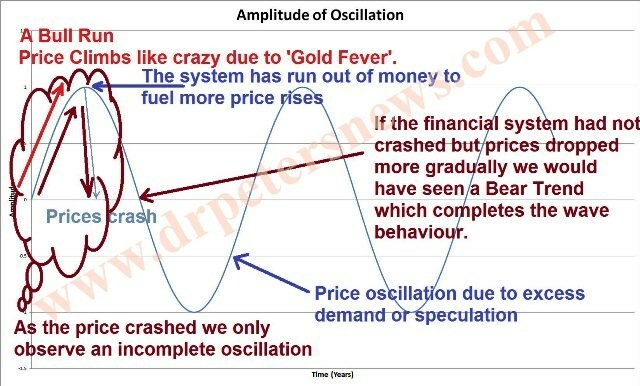 Do note there are many types of oscillations, the tulip mania was a 'finely tuned' oscillation, business cycles, the Austrian Economics Model, are milder forms of oscillations. Most economists would not have been able to see that the markets were oscillating. In fact economies oscillate too. Some years are boom times and some years are a little slower. And such conditions can be managed, if the economist had known of my theories. I believe recessions can be prevented hence I have spent 18 years developing an alternative theory of economics. If you examine the chart above which depicts an oscillating market, you will see the red arrow which shows a bull run, if this was a stock market chart. If it were a consumer market price chart it would be showing hyperinflation. Mathematically, a Bull Run and hyperinflation are exactly the same phenomena but occurring in different markets. The Bull Run or hyperinflation describes phenomena where the products for sale are limited by quantity and the number of potential buyers exceeds the number of products for sale. Hence as potential buyers enter the market the price begins to climb, a Bull Run or hyperinflation sets in. A clear example is the stock market where every company listed on the stock exchange has a fixed amount of shares for sale. Companies cannot keep adding more shares into the market when shares are sold to investors or speculators. Eventually, the price of the share climbs so high that its price is out of reach of most buyers. The rise in price stalls and then prices tumble. If there is panic among those who have shares then we will see a market crash followed by a recession. This is because everyone wants to be the first to cash out of the market, thus creating a sell stampede and a recession. A recession because many people have put their life savings or even borrowed money to invest or speculate in the markets. When the market crashes there is a shortage of spending money and a contraction is consumer spending making the recession even more severe. 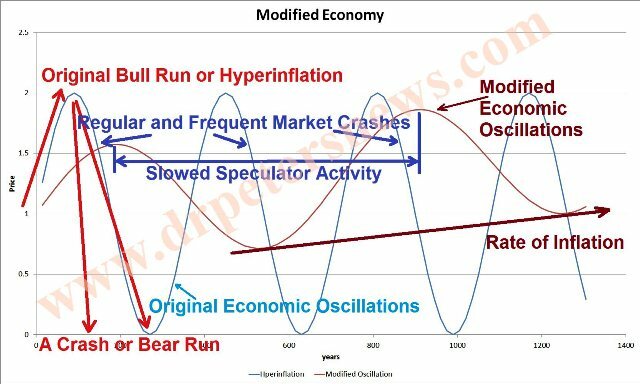 If there is calm about price drop then we will see a Bear Run or a Bear Rally and most likely result in an economic slowdown instead of a recession. Properties are subject to similar forces as in a Bull Run or hyperinflation as it is almost impossible to bring new houses or apartments into the market overnight. It takes a lot of time to purchase land, get approvals for land conversions, get architectural drawings approved and begin constructions. Construction itself will take some time and this is followed by more certifications before the house can be put on the market. Hence it is pretty easy for housing sectors to form property bubbles, hyperinflation or suffer from Gold Fever, crash and forcing a recession. What fuels the housing bubble? Well I guess we know very well that bankers are in for making big bucks so during boom times they will make cash and loans freely available. That gives a tremendous push to fuel property price rises. It’s the easy availability of capital the tempts more buyers into the market. Once the property prices begin to climb quickly, the speculators come into the property market. I have seen cases where they put down the 2% earnest deposit and sell the property to someone else and make RM200,000 (US$67,000) with two weeks. That kind of easy money will fuel more speculators to enter the market and drive the prices even higher. The genuine home buyers and long term investors end up paying very high prices for their properties because the speculators have come in and flipped houses for profits. This is not creating any new wealth; it is just re-distributing wealth to different people - to the gamblers. There are many ways to slow property inflation or hyperinflation or bubble. Firstly, reducing the money supply into the property market and there are many ways this can be done. Secondly, discourage speculation within the property market by having proper Real Property Gains Taxes. This will make it unprofitable or less profitable to flip houses. Furthermore buyers can have their deposits forfeited and Sales and Purchase Agreement processing terminated, if they are found to be flipping houses. One could even disallow property owners from selling their properties before the titles are issued in their name. There will be a problem with this in Malaysia as I know of owners who haven't received their titles even after 10 years of waiting. Furthermore many are buying and selling properties without a title but based upon caveats or charges on the master title. I believe in some countries, you actually don’t need to pay Real Property Gains Tax if you purchase another house within one year of selling your old house. That is a sure way to start another property Bull Run or bubble or hyperinflation because that encourages house flipping. The real danger of property bubbles is that it takes money out of other areas of Real Economy and diverts that cash flow into the property market. I think this is the single most important effect of a property bubble or hyperinflation that many economist missed. Why would you want to buy that new car or new TV set when you can flip houses and earn big money in a short time? Hence the rest of the economy begins to slow down when a property bubble materialises. This results in an even worse crash where, not only the property market crashes but other sectors of the Real Economy which have slowed down considerably, suffer mass lay-offs and job losses, thus creating a debt crisis. Thus a terrible economic recession in the US and which lead to a worldwide global economic recession. The sharp rise in prices due to hyperinflation lessens when you reduce the number of speculators. Therefore it would take a longer time for the money supply, into the housing market, to run out. Furthermore inflation and not hyperinflation, becomes the predominant factor in determining property prices when you reduce speculation. I would suspect that the modified oscillations would be slower and more manageable and you will have plenty of time to plan and make economic or financial adjustments. The danger of speculation is that too much speculation will cause hyperinflation resulting in large swings in the economy. Furthermore, the normal cash flow and normal healthy circulation of money in the economy gets disrupted creating weakening economic conditions as other sectors of the economy see less supply of money such as slower sales resulting in lay-offs ...etc. The underlying phenomenon that goes unnoticed or is misunderstood is the diversion of the supply of money during a property bubble or hyperinflation. This will finally result in market crashes and recessions. On a final note, my charts exaggerate the swings to clearly show how economies oscillate. The average man on the street will not notice most of the oscillations in the economy. Only those who are deliberately looking for oscillations will see them. The average man in the street generally only feels the impact of inflation. Further understanding please go to "how to predict market trends"